The programme aims to empower factory workers with regard to their rights in the workplace as well as imparting knowledge. The training of courses is designed to boost workers’ self-confidence so that they can assert and apply their workers’ rights. This is achieved through Worker Education Groups (WEGs). Participation in these groups, which are organised by the textile workers themselves within a particular community, is voluntary. 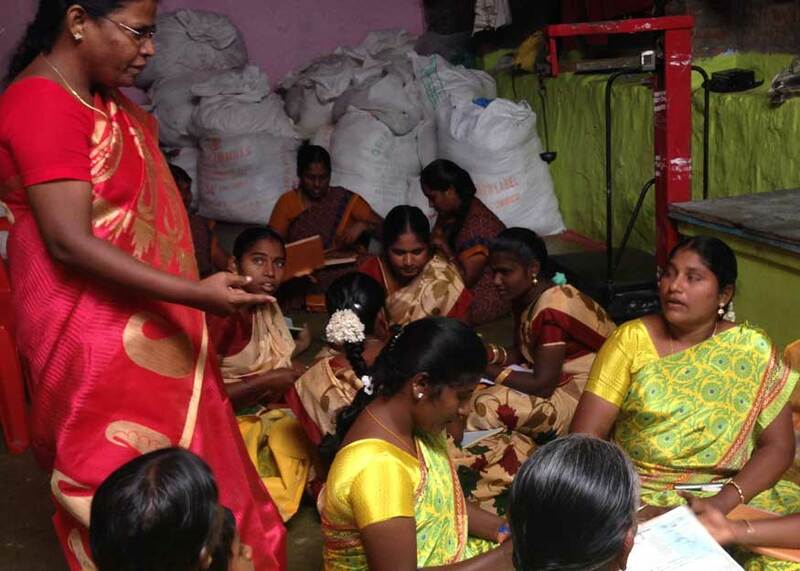 Building on the existing activities in the workers’ districts of Tirupur, our partner organisation SAVE encourages workers to join the Worker Education Groups, each of these groups has 15-20 members (women, men, or mixed). Once a group has been formed, it works through a four-year training plan with the support of the NGO SAVE. The subjects covered by the training plan go beyond general skills and include personal development, state social assistance, health and safety in the workplace and workers’ rights. The participants are also taught how to support each other and share their knowledge with the wider community. The training builds on the basic principles of a positive feeling of self-worth. The aim is to overcome anxiety and to enable workers to cooperate and be proactive by enhancing their knowledge. Participants are asked to pass on their knowledge to at least five neighbours or colleagues. They are trained in workers’ rights so that they can apply these rights in practice. For this reason they are often regarded as leaders of their communities; this enables them to share their knowledge with many other workers. It is a condition of participation that participants allow their children to attend school and promote schooling within their networks. Since 2009 the project has supported 436 learning groups with more than 6,000 members – of whom more than a third have been women. It is estimated that more than 30,000 workers have been reached through this group work and hence enabled to enlarge their knowledge. It has also been observed that all the children of participants are attending school. The results show that the textile workers’ awareness of their rights has been increased through the provision of knowledge. Many participants have applied their acquired knowledge and new skills at home, in their communities and in the workplace, thereby improving their living and working conditions. As a result of their newly learned skills, some participants have been voted onto the workers’ committee in their factory; these committees negotiate with the factory management in solution-oriented ways.